Not sure what to do with that old toy box that your kids have outgrown? Instead of sending it to the landfill, why not turn it into a useful piece of furniture? With a little bit of paint and a few accessories, you can have an adorable farmhouse-style bench for your entryway that doubles as a great shoe organizer. We finally decided this past fall that our kids had finally outgrown their old toy box. While I’m a little sad that they are growing up so quickly, I’m happy to be rid of the toy clutter that lived in our playroom. But after we parted with the last of the toys, there was the question of what to do with the old toy box. It wasn’t in good enough condition to donate…after years and years of daily use, it had quite a few scratches and dents in the body. And that’s not even counting the broken hinge or that 3 of the legs had fallen off. The body of the box was still useful though, and I wanted to try to keep it if I could. 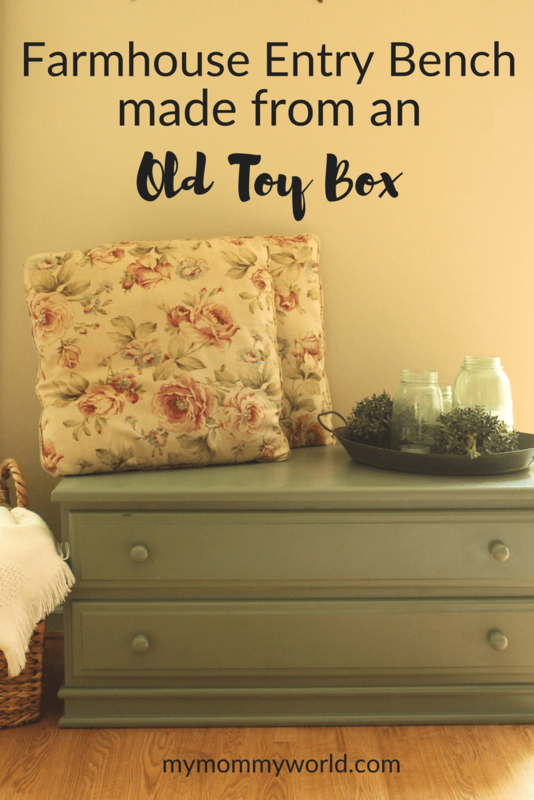 What to do with an old toy box? After sitting in our garage for several months, I decided I would try to turn the old toy box into a bench for our entryway. I just love all the photos of the farmhouse-style entryway benches that I’ve been pinning over the past few months, and wondered if I could recreate something similar with my old toy box. While our entryway isn’t very big, we do need it to be very functional. Since we don’t have a coat closet on the first floor, we have to hang up our coats on hooks and leave our mittens/scarves/umbrellas in the entryway. We also take our shoes off every time we come into the house, since they tend to track in a lot of dirt and leaves. I had a big wicker basket by the front door for shoe storage, but it wasn’t very efficient since everyone’s shoes got all jumbled up together and made it hard to find the pair you wanted when it was time to leave. The other problem was that there was no place to sit down in order to put on your shoes. It was fine for the kids, who didn’t care about sitting on the floor, but not so fine for mom and dad. The bench could only be an improvement over the existing entryway situation. Repainting the toy box was the first step to creating a new entryway bench. 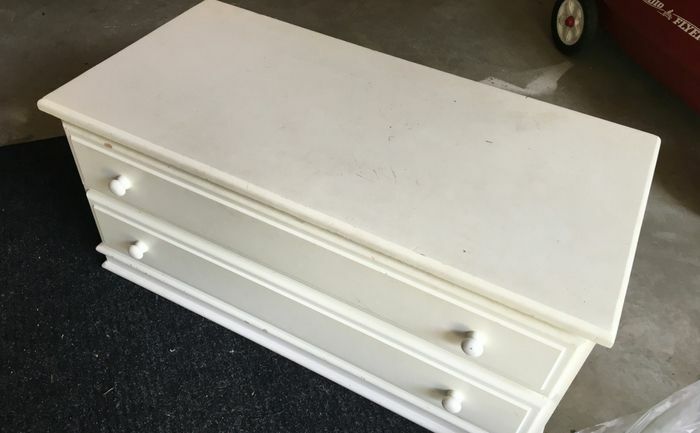 Since our old toy chest was already painted, it was a pretty easy process to repaint it. First, I took a wet microfiber cloth and wiped the box down really well to make sure all the fingerprints, dust and spider webs were gone before starting to paint. While you could lightly sand the wood as part of the prep for painting, I decided not to do that with our toy box. The old layer of paint was in relatively good shape (no peeling or cracking), so I knew that they new paint would stick just fine. Next, I spray painted the toy box with a can of Rustoleum Ultra Cover paint and primer. I chose Sage Green, because it’s my favorite color and coordinates with my color scheme. 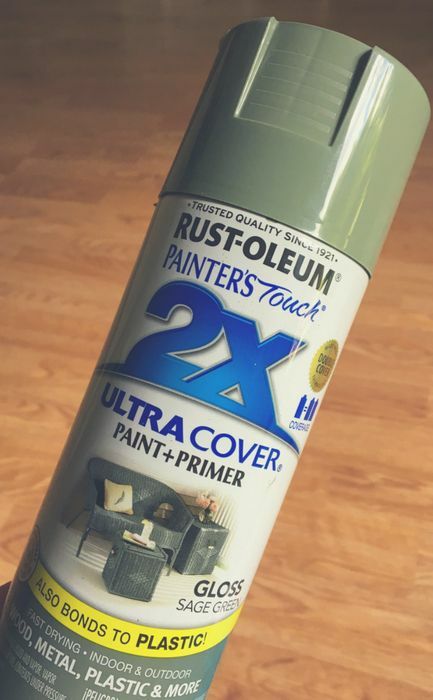 I also chose to use a gloss paint because I knew that this bench might get a little dirty with scuff marks or whatever, and I wanted to be able to wipe it clean it easily. This paint covered the old box very well. Most of the scratches are hidden now, and the coverage is so good that you could never tell that the box used to be bright white. It took me a few days to get the whole box painted because I wanted to give it a lot of drying time in between painting each of the sides. So I painted the top and the top half of the sides, then left it to try for a day, then turned it over and painted the bottom half of the sides. You could probably get the painting done more quickly if you just gave each side a few hours to dry and continued on with the rest of the project. When the painting was done, I headed to the craft store for some baskets to use inside the toy box as shoe storage. I measured the inside of the box, noted the measurements in a note on my phone, then took the tape measure with me to the store. While at the store, I literally measured a bunch of baskets with my tape measure until I found one that would fit. I calculated that I could fit exactly three of these baskets in my box, and luckily, they fit just perfectly when I got home. Since we have 4 members in our family, 2 of us have to share a basket for our shoes, but it still works a whole lot better than that one big basket we used to have! The other good thing about having this shoe organization system in the new entry bench is that all the ugly shoe clutter is gone from the entryway. No more looking at a pile of shoes when you first come into the house! It’s also nice to have a spot to sit down next to the front door to put on your shoes when you get ready to leave. While I don’t usually leave pillows and candle trays on top of the bench, since ours opens up to storage, you could totally add a seat pillow made of foam to the top in order to make it a little more cushioned. Maybe a bench pillow craft is in my future…who knows? I hope that if you have an old toy box that you’ll think about repurposing it into a new bench for your entryway! With a $4 can of spray paint and a little bit of time, we made an old piece of furniture new again! What a great project and it turned out so nice too. I love the idea of putting baskets inside to keep the shoes sorted. I’m pinning it. I love how your project turned out, Erin! Great job!! 🙂 I’ve finally started doing a little painting and DIY-ing around our house and it feels good.